Today's Featured Fluff Addict is...Crystal from Biehl Adventures! Today's Fluff Addicted mama is Crystal of Biehl Adventures! Tell us a little about yourself, where you are located, how many kids you have,little ones in cloth, etc.- I'm a former middle school teacher-turned-SAHM to 1 handsome little man named Collin who was born in December of 2009. I live in Indiana with my hubby of 5 + years (he was my high school sweetheart) Fun fact: My hubby and son share the same birthday! What made you decide to give cloth diapers a try? Originally, it was all about saving money. But now that we've done it for 9 months, we love that only cotton touches our little man's bum. We also love that we aren't adding to the landfills with disposables. What were your friends and family's reaction when seeing the "new" cloth diapers and have they been supportive or skeptical of your choice to use cloth diapers? All our aunts/moms/grandmas couldn't believe how much easier it was now! My friends all think the diapers are so cute! I've had several expecting mom friends message me about cloth diapers -- wanting to know my favorites, if washing them is really that bad. 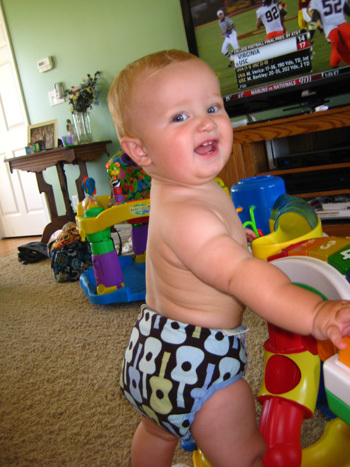 We've received nothing but support and praise for using cloth diapers. In fact, another cloth diapering mama and I may have converted a mom of twins to cloth! She wanted lots of info! What was your very first cloth diaper? Cotton Babies prefold with a Thirsties cover and also a Bumgenius AIO. What type of diapers does your stash primarily consist of; pockets, aio, onesize, prefolds, flats, hybrids, etc.? Mostly pockets but ..being a fluff addict who can't resist a good contest when she sees one..We also have prefolds, fitteds, AIO, AI2s...pretty much a little of everything. What is your favorite Knickernappies product or which Knickernappies product are you dying to try and why? I would love to try a 2G pocket diaper because I love side snaps, elastic at the front and back...and it comes in CHOCOLATE!! Do you have a favorite place to hang out and talk or learn about cloth ; a blog, message board, facebook page, etc.? Love love love the Twitter #clothdiapers chats on Monday. Pretty much if there's a Facebook page about cloth diapers...you'll see me there. What cloth diapering item, besides diapers, do you consider to be a must-have accessory? It's a tie-- Diaper Sprayer and Cloth Wipes! If you could share just one tip with someone who is just starting out with cloth or considering using cloth, what would be your best piece of advice to them? Educate yourself--there are so many facebook pages, blogs, and tweeps who would love nothing more than to share tips and advice about cloth diapering! 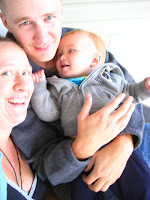 You can find out more about Crystal by visiting her Blog, Biehl Adventures! Also, make sure to check out her event Fluff Baby Home where she's working to raise funds for her brother and sister-in-law's international adoption! You can read more about Fluff Baby Home by clicking HERE.